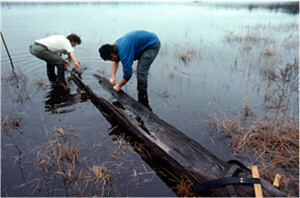 Florida has many waterlogged sites, some of great antiquity and diversity. 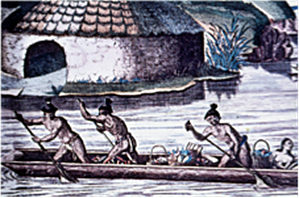 In this paper, I show exam-ples from these sites – Windover, Hontoon Island, Lake Monroe, Belle Glade, Fort Centre, Key Marco, canoes – and discuss briefly their significance, contributions to an understanding of Florida’s herit-age, broader connections, and their present condition. Sadly, Florida has swept much of its wetlands heritage under a grid of busy streets. In late March 2016, international news sources reported the wanton destruction of ancient stone monuments by militant groups. The entire civilized world was aghast. Yet, almost daily, the environmental and cultural heritage entombed in waterlogged archaeological sites is demolished by ambitious dredging, draining, and development projects. The repercussions of this situation are not known or understood by the general public. The ethnographic and ethnologic information lost when water-saturated sites are destroyed far exceeds that of stone sculptures and pillars. I have been involved with and concerned about the invisible heritage of wetlands for fifty years, beginning with the Ozette site on the Olympic Peninsula in the state of Washington. I challenge WARP members from diverse areas to tell their stories in a way that will bring global attention to this situation. Perhaps we should put together a non-technical, broadly publicized book with lots of pictures aimed at an audi-ence of interested adults and young people, as well as government and business enterprises.